Dog Food Guide > Dog Food > Does Your Dog Really Need A Prescription Dog Food? If you are thinking about prescription dog foods it probably means that you have received some kind of bad news about your dog’s health. He has a health problem and you need to make changes in his diet. Your veterinarian may have recommended a prescription dog food. We are not vets and we don’t know your dog’s individual health problem. However, we can give you some information about prescription dog foods to help you make an informed decision with regard to your dog’s diet. There are differing opinions about prescription dog foods, even among veterinarians. The early creator of these diets was Hill’s and they are still the largest brand in this category. Other companies that make veterinary diet formulas include Eukanuba, Royal Canin, Innovative Veterinary Diets (IVD), Purina, and Waltham. As you can see, most of the companies involved in making prescription dog foods are large corporations. It takes money, a large staff of researchers, facilities, and other overhead to invest in these diets. Small, innovative holistic pet food companies rarely have that kind of money to invest though they could grow to make prescription pet foods in the future. You have to have a prescription from a veterinarian to obtain one of these foods, though you don’t necessarily have to purchase them from your vet. You can use the prescription to buy the food online, for example. As you probably already know, prescription diets tend to be very expensive. In theory, prescription dog foods are medications. The companies that make them spend a lot of money on research and development, just as drug companies do when developing new medications. A vet prescribes a specific food after diagnosing a dog with a specific condition, then monitors the effects of the food on the dog. In order for a dog food manufacturer to claim that one of their products is effective for a certain disease, the Center for Veterinary Medicine (CVM), part of the FDA (Food and Drug Administration) must see research from the company proving their claims. The company has to show full documentation that the food is safe and that is works. The food still has to meet AAFCO’s general labeling guidelines but the CVM watches over their medical claims. Many people complain that these dog foods have low quality, filler ingredients and low meat content. All you have to do is read some of the labels and you can see that these complaints are justified in most cases. Most prescription dog foods do not have high quality or holistic ingredients. Meat content is intentionally low in some foods because certain health conditions may not allow for high percentages of protein, so that’s a separate issue. But it’s not unusual to see veterinary diets with ingredients that you would not normally like to feed your dog. For example, Brewers rice is the first ingredient in one food from Hill’s – $89 for a 25 pound bag. Yet the food receives 4.5 stars out of 5 from reviewers and 95 percent of the people who bought the food would recommend it. Yes, in many cases prescription diet dog foods do seem to work when they are correctly prescribed for a dog’s condition. If your dog is sick, you may have to put aside your dislike of some of the ingredients in the food and focus on things that work. Dogs do benefit from ingredients in dog foods that are not holistic. Sometimes it’s a question of having a precise ratio of protein, fat, fiber, or other nutrients. Sometimes a food may contain an unusual ingredient or work in some other way. For example, Hill’s makes three kinds of diets for dealing with bladder stones, depending on what kind of stones your dog has. If your dog has struvite stones, their s/d diet works by making the urine extremely acidic to dissolve the stones. Their c/d diet also acidifies the urine but can be fed as a preventive. And their u/d diet is used for urate and cystine stones. So these different prescription diets actually have ingredients that affect the acidity of your dog’s urine. That’s what you’re paying for with prescription diets. It doesn’t show up in the guaranteed analysis or the things we normally look for on the dog food label, but it can be very important if your dog is ill.
Do you have to feed a prescription diet? Manufacturers of most prescription diets also caution against long-term feeding of their diets. Most of these diets are extremely restricted in specific nutrients and they are not intended to be fed long term, as significant deficiencies can develop. This is certainly true. However, we do note that the same thing is true of any medication. You would not continue to take penicillin on a long-term basis. Prescription diets need to be considered as medications, to be used as short-term treatments for a specific medical health condition. Dr. Gruenstern favors a raw diet, though that may not be feasible for all dog owners, especially when they are coping with a sick dog. What about over-the-counter dog foods for health conditions? There are lots of dog foods today that make health claims although they may be skirting the FDA by doing so. If you check the FDA web site, you can find occasional warning letters sent to various pet food companies over the years advising them to stop making certain health claims about their foods. You can find commercial dog foods for dogs with various health issues such as sensitive digestion, food allergies and food sensitivities, weight problems, healthy joints, and foods for senior dogs. To take foods for healthy joints as an example, it’s not unusual for many dog foods today to have added glucosamine and chondroitin, especially in foods for large breed dogs. However, the amounts of glucosamine and chondroitin added to these foods are not considered to be a therapeutic level. In order for your dog to actually benefit from these supplements, you would have to give him more than the amounts normally added to over-the-counter dog foods. If dog food companies added a therapeutic level of glucosamine and chondroitin to their foods, they would have to be overseen by the CVM/FDA like a prescription dog food. (You can read more about these supplements here.) Feeding a dog food that contains glucosamine and chondroitin may be helpful in minor ways (though evidence is currently lacking) but if your dog really needs a joint supplement, you are better off adding your own supplements to your dog’s diet. You will notice that the labels for over-the-counter dog foods are usually very general. They won’t say they actually prevent or treat a problem since those are medical claims. Instead, they will use vague terms such as “promote” or “support.” They are less likely to get in trouble for using these terms and don’t have to provide proof of their statements. Over-the-counter dog foods making these health statements are overseen by AAFCO rather than CVM/FDA, unlike prescription dog foods. These diets have not had as much research or work put into them as the prescription diets. However, in many cases the breakthroughs made with prescription diets eventually end up benefiting dogs by being incorporated into commercial dog foods. The bottom line with prescription diets is that sometimes dogs really need them, regardless of whether we like the ingredients or not. Hill’s once dominated this field but with more competitors, it means there are now more choices for many veterinary – and over-the-counter – diets now. If your vet prescribes a diet for your dog and he won’t touch it or he doesn’t seem to be improving, you may have other options. Do keep in mind that over-the-counter foods do not have the same therapeutic values as prescription diets, even if they are more or less designed to address the same health problem. In some cases they may be a good alternative to a prescription diet if you are coping with a weight problem or a food sensitivity, for example. In other cases, there is no substitute for a prescription diet. 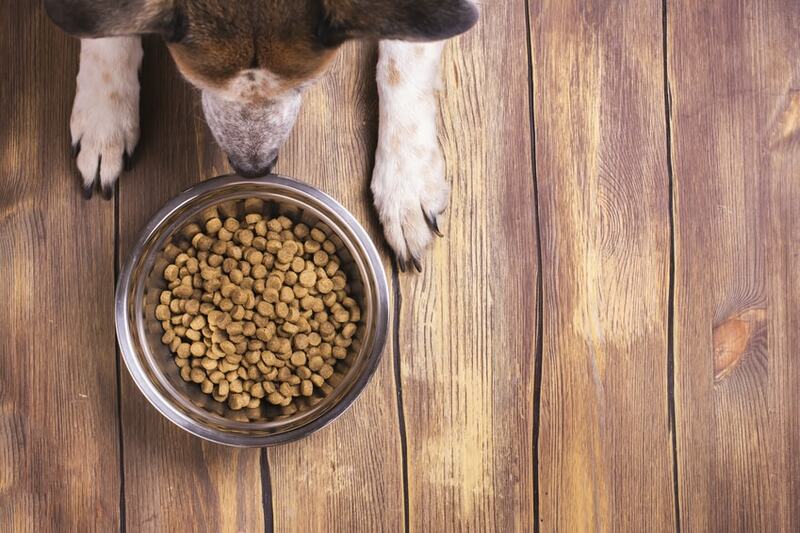 Over-the-counter dog foods won’t produce the same results as these diets for some problems. If your dog has a serious health problem, work with your veterinarian to find a diet that will help your dog. Finally, as noted above, remember that veterinary diets are not intended to be fed on a long-term basis. These foods are medical in nature. They should be considered the same way you would consider a prescription from your pharmacy. Give it to your dog as a treatment and work with your veterinarian to see his health improve. Then move on to a good quality diet that is appropriate for his health situation.